Pros : Looks nice and very sparkly. Cons : Angles in the middle were off slightly,but easy to correct with a little grinding. Pros : I surrounded this cross with a rainbow of colors on the outside and with a blue background. It looks beautiful hanging in the window. Very easy to work with. Cons : None of the sections came together nicely. I now have to grind all four pieces to fit together. Pros : I like the clear (white) bevel glass, especially when surrounded by clear colored glass. 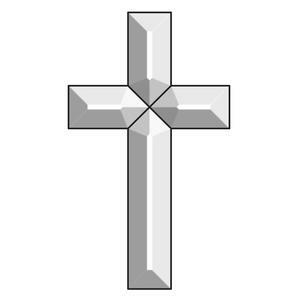 Other Thoughts : I think the cross stands out nicely.